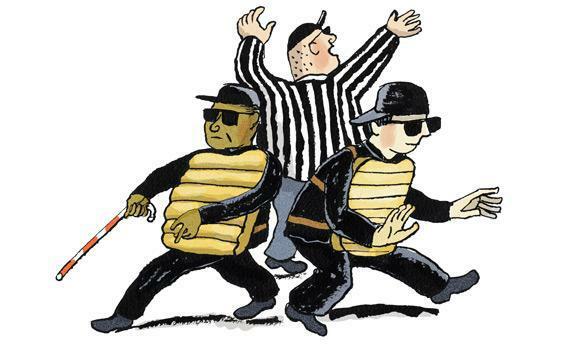 “Three Blind Mice”: Why it’s baseball umpires’ least favorite song. Those are the modern words to “Three Blind Mice,” that pleasant enough English nursery rhyme that we all remember from our youth. Back in the early 17th century, when the folk round was first published, that language was completely different. Words like scrapte and licke made it seem more sinister, as did the purported reference to Queen Mary ordering the execution of defiant bishops. Today, the song has lost those sharp edges for everyone but one small group: those beleaguered souls who make a living calling balls and strikes. Fans at Jackie Robinson Ballpark immediately booed the fully sighted Seneca, who Deadspin later deemed “the most sensitive umpire in baseball history.” The unpaid intern, who was fined $25 by the Florida State League for getting thrown out of the game, parlayed his infamy into a handful of media appearances. He even made it to SportsCenter. Seneca, meanwhile, has made no public comments, allowing the sports media to make like an angry manager and rain spittle on his expressionless face. Justin Klemm, executive director of the Professional Baseball Umpire Corp., which governs minor league umps, says this silence is intentional. “Mario has decided not to talk about this and we’re respecting his wishes,” Klemm told me. Both O’Connor and Seneca are backed by the PBUC manual, along with decades of precedent. Fans and managers and players have been questioning umpires’ eyesight since the day baseball was invented. Bob Emslie, who began umping in the 1880s, was given the nickname “Blind Bob” by legendary manager John McGraw. A more general pejorative, “Blind Tom,” became associated with baseball arbiters in the early 20th century. Despite the quotidian nature of these vision-related insults, “Three Blind Mice” has always had a special power to enrage. Umpires have been chucking anyone with the temerity to so much as hum the song since at least 1936. According to an Associated Press report from July of that year, umpire and Norman Rockwell subject Beans Reardon “chased [pitcher] Jim Weaver off the Pittsburgh bench” for singing the song, proving that if catchers wear the tools of ignorance, umpires don the tools of sensitivity. In 1941, the Cubs expanded the possibility of song-based heckling by introducing the first ballpark organ. Though Wrigley Field ivory tickler Roy Nelson stuck to friendlier fare, the musicians weren’t as kind in Brooklyn. In May 1942, Ebbets Field’s Gladys Goodding welcomed Bill Stewart, Ziggy Sears, and Tom Dunn to the field with umps’ least-favorite nursery rhyme. “It was a request number from a fan,” UPI reported. The fan may have been a part of the Dodgers Sym-Phony, a ragtag band that kept up a running commentary on the on-field action with a rotating cast of horns and drums. “Three Blind Mice” was long part of the Sym-Phony’s repertoire, along with “The Hearse Song” (“The worms crawl in, the worms crawl out/ The worms play pinochle in your snout/ They eat your eyes, they eat your nose/ They eat the jelly between your toes”). For the men in blue, ignoring “Three Blind Mice” is easier said than done. Goodding eventually stopped playing the song. The reason: A formal complaint from an umpire led the league office to tell her to cut it out. While Gooding and Melgard heeded the warnings of their leagues, Vince Lascheid, the Pittsburgh Penguins’ organist from 1970 to 2003, preferred to live dangerously. Though the NHL ordered him to cut the song from his repertoire, he said he still snuck it in every now and then to “see what would happen.” Nothing ever did. In the cases when an organist or, more commonly these days, a button-pushing intern does get heaved, the question of jurisdiction always comes up. And the answer is: Yes, they can do that. The PBUC’s umpire manual says, “Organists are not to play in a manner that will incite spectators to react in a negative fashion to umpires’ decisions” and stipulates that a violation “can result in the umpire dismissing the violator from his or her duties for the remainder of the game.” Counter to the minor-league law of the land, MLB’s official rules are less explicit. Though there’s no specific mention of music, they do grant umpires the “authority to order a player, coach, manager or club officer or employee to do or refrain from doing anything which affects the administering of these rules, and to enforce the prescribed penalties.” Think of it as baseball’s necessary and proper clause. The trouble for umpires is that we only hear about it when they pitch a fit. Ignoring “Three Blind Mice” doesn’t warrant blog posts, sports radio segments, or mentions from Paul Harvey. But it’s worth saying that not all officials have skin as thin as a Pirates-era Barry Bonds. There are indeed umps who possess an unexpected ability to take a ribbing without retaliating. Or maybe there’s another explanation. Perhaps it’s just that their hearing is as bad as their eyesight.